With all of the Disney expansions occurring at both Walt Disney World and Disney's California Adventure there is so much to choose from. I'm going to go with the recently announced updates of the Fantasyland Expansion at Walt Disney's Magic Kingdom. Before I get to my favorite part of this expansion I want to discuss the changes to Snow White. I know many people are disappointed that "Snow White's Scary Adventure" will be going the way of the attractions of yesteryear, but I'm excited about this. I think the new attraction "The Seven Dwarfs Mine Train" sounds like so much fun. It's a first-of-its-kind with it's style of ride system, which will swing back and forth along a twisting track. I'm looking forward to checking this out in 2012. Now on to the one thing I'm most excited to see, the Beauty and the Beast area. 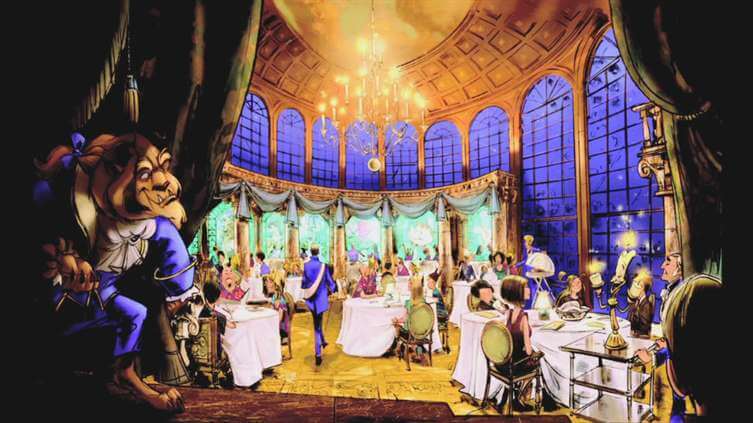 One of the reasons being the new restaurant that is being elaborately designed to look like the ballroom in the movie, called "Be Our Guest". The restaurant will seat 550 guests and is going to be a counter service location during the day, and then in the evening transform into something so much more with sit down table service. In addition, they will be adding a small eatery, "Gaston's Tavern". Unfortunately, unlike in the movie, it will not serve beer. Sad but true. Also in this same area will be a gift shop "Bonjour! Village Gifts" and a cottage for Belle to interact with guests called "Enchanted Tales with Belle". I'm so excited for this section to be open and can't wait to try this new restaurant. It combines my favorite movie, favorite princess and favorite past time - eating. There is so much more going on with the Fantasyland Expansion but I just covered my favorites. The addition of more Beauty and the Beast experiences is my favorite, especially the new restaurant.